It is important to note that many illnesses may appear to be clear cut, but often times to the inexperienced eye, many symptoms appear similar, and many ailments have similar symptoms. While this guide allows you a greater understanding of guinea pig health and rudimentary diagnoses, it should in no way be substituted for professional veterinary care if the need arises. This section gives you an idea of how to treat many ailments, and some of which can be done at home, yet even the most experienced cavy caretaker needs to consult a veterinarian experienced in exotics. As a side note, please be aware that there will be photographs of ill cavies, symptomatic cavies, and cavies being treated in the following sections. 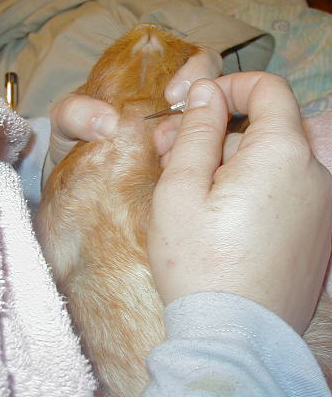 These photographs are necessary to effectively diagnose and treat your guinea pigs. If you are squeamish about such things, be forewarned! There are several things you can keep on hand at home, in the event of an emergency. Some of these things are necessary for full in home treatment of minor ailments, and some are necessary for emergency care while you are trying to get a hold of your vet. In any case, no well-prepared cavy home can live comfortably without some of these supplies! Most if not all are available over the counter at your local pharmacy or feed store, while some may be purchased over the internet. Suppliers may be found in the appendix. Zimecterin horse worming paste (for mites), injectable or pour on cattle ivomec Eprinex. Kitten safe flea shampoo (for lice) - I prefer Zodiac kitten and puppy shampoo or Ectosoothe. Pyrethrins must be an ingredient to be affective against lice. You can also use a small animal spray good for fleas, ticks and lice, I believe 8-in-1 puts out a good product, as well as any good kitten flea powder. Triple antibiotic ointment or cream. This can be any good one you'd use on yourself such as Neosporin, Nolvasan Panalog, or a generic brand at the pharmacy. Bag Balm (baby section in grocery stores or in feed stores). This is helpful for nursing moms with 'vigorously nursing' babies, scabbing wounds, or dry irritated skin. Cotton swabs (q-tips) and cotton balls for cleaning out ears, administering ivermectin (q-tip that has been 'de-fluffed'), cleaning eyes or wounds. Eyedropper for handfeeding newborns (syringes tend to cause aspiration easily). Syringes with and without needles. Syringes can be 1 cc (handfeeding babies or flushing wounds), 3 cc for handfeeding larger babies and giving medicines), 5 cc for handfeeding adults, and 10 cc for other purposes. The larger the gauge of needle the smaller the size will be (ie an 18 gauge needle is actually larger in diameter than a 25 gauge needle), so for injections on pigs, I prefer 22-25 gauge needles. Eighteen gauge needles tend to leave large injection holes, and are uncomfortable for the pigs, however these are the most handy size if you have to lance an abcess. Johnson's baby shampoo, Suave baby shampoo, or Ectosoothe is very handy as a normal shampoo for pigs, as needed. Lysol concentrated disinfectant (available at RiteAid) for treating fungal problems on the skin. Also helpful, any good dandruff shampoo like Desonex, or even LymDip. Also recommended: Mycodex, tinactin or any good athlete's foot powder, cream or shampoo. White vinegar for fungus in the ears. Hydrogen peroxide for wounds or excess exudite in the ears. Witch hazel for small cuts and lacerations. Tea Tree oil or oatmeal skin remedies and shampoos for irritated or dry skin. Ear mite rinse for kittens, rabbits or puppies. Children's kaopectate, cherry flavour (for diarrhea). Also in a pinch, you can use any good 'wet tail' remedy in the small pet section of the pet store. Nutrical or Critical Care supplements, high calorie dietary supplement for animals with lethargic feeding response or for emergency feeding (use 5-10 cc syringe for administering). Most pet stores carry this in the puppy/kitten handfeeding section. Probiotics such as benebac, probios, or any other good source of acidophilus or lactobacillus. Always use an hour after using antibiotics. Terramycin opthamalic ointment for eye injuries, irritations or infections. Popsicle sticks (emergency splints and for viewing molars). Betadine, or any other good iodine surgical rinse (for cleaning out wounds or abcesses). Vet wrap (for splints or bandages - be careful, this tends to tighten as it's being wound up, so practice bandaging a finger first so you know how tight to make it). Clean sterile gauze bandages (for wound dressing and splints) and handtowels (handy for restraining as well as isolating wounded areas). Saline solution (rinsing eyes, mouth, and wounds) - available in the contact lens section, be sure it's ONLY sterile saline solution, not disinfecting solution! VERY different products!!! Sulfa based antibiotic such as Sulmet or Septra (tribrissum). Oxytocin (available only through your vet) for stimulating contractions in a weak or struggling pregnant sow. Propylene glycol, karo syrup, pedialyte and molasses for immediate nourishment, energy and calcium in struggling toxic sows. KMR (Kitten Milk Replacement), Esbilac (Puppy milk replacement) or Ensure for handfeeding babies. Liquid Calcium (without Magnesium if possible) and Vitamin C liquid or crystals (keep in the fridge or freezer respectively). Scissors or clippers for cutting wraps, hair matts, bandages or hair around a wound. Number of the closest emergency clinic who deals with exotics, as well as the number of the closest exotic clinic should your vet be out of town. Did you know there are only 4 types of animals out there who can't formulate their own Vitamin C? Primates (apes, lemurs and monkeys), dogs, humans and guinea pigs! You have more in common with your piggy than you thought! So what does this mean? This means that your guinea pig will need to have its Vitamin C in his or her food on a daily basis. Now, how does your piggy get Vitamin C? One source is through enriched pellets. Most people rely on this, however, don't use it as your sole source of Vitamin C! Vitamin C is a very unstable vitamin and at best lasts for 90 days. It breaks down even more quickly in light and with exposure to air or water. In water it lasts about 24 hours. How do you get your guinea pig food? Unless you buy Mazuri, Oxbow or bags of 25# or so, your food comes prepackaged in a clear (lets light in) bag, and isn't dated as to when it was milled. During the milling process they use water. See why it's a bad idea to use your pellets as a sole source of Vitamin C? Unless your bag is stamped with a mill date, you have no idea when it was milled and cannot guarantee it's been milled within the last 90 days. How do you supplement Vitamin C? Most folks use greens, or a powder in the water bottle which they change daily, or a powder they sprinkle over their gpigs treats. Some folks use liquid, some cavies will even eat a children's vitamin tablet from their owners hand! Whatever works easist for you and the cavy enjoys, that's what you should do. Vitamins can be broken down into two types, fat soluble and water soluble. Fat soluble vitamins include Vitamins A, D, E and K, and these are conveniently stored in the fatty tissues of the body, such as the brain, the liver and the other organs. The water soluble vitamins include Vitamin C, B-complex, Niacin, Biotin, Folic and Pantothenic acids. The water soluble vitamins flush out of the body with the waste, and must be restored on a daily basis through the diet. It takes about 10 days for guinea pigs to use up the Vit C stored in the liquid in the cells of the body. Cavies up to 2 years of age start to show signs of scurvy at about day 9-10, animals older than that will appear normal until day 14. In 1972, researchers Odumoso and Wilson found that it took about 12 days for the rapid weight loss to start. By day 27 on the diet without Vitamin C, cavies were weighing less than the inception, exhibiting symptoms of scurvy, and dying spontaneously. The understanding of scurvy came about with early known sailors and explorers. On the long ocean voyages without access to fresh fruits, veggies and greens, dried nuts, meats and grains were the primary source of nutrients, things that would store well on the voyage. When sailors took ill, they would complain of many of the same symptoms, hair loss, skin problems, diarrhea, stomach cramping, muscle tremors, and stiff joints. Scurvy killed more sailors than war. In the mid-1700's an experiment was conducted by Dr James Lind. He found that there was a substance found in limes that would prevent the symptoms within the first 90 days. In the early 1900's a Hungarian research team isolated the same thing from lemons, and in the 1930's the compound became manufactured as we know it today, ascorbic acid. Your pig looks a bit off, so you wonder, maybe she or he is suffering from scurvy? How do you tell? · Unwillingness to move characterized by stiff joints and limbs. Hopping, when prodded into moving, appearing tender in the joints and muscles. · Poor flesh condition, thin, emaciated. · A stance with the feet tucked under the body. · Full or partial paralysis of the hindquarters. In postmortem exams of extremely advanced cases, the adrenal glands will be enlarged and bleeding. Hemorrhaging, or bleeding, will be present in the joints, the intestine, and the muscles between the ribs. How Much Vitamin C is Necessary to Prevent Scurvy? Waugh and King (1932) found that 0.5mg of Vitamin C per 100 grams (3.5 oz) of bodyweight was sufficient when the criteria selected was the growth rate of certain body tissues. Dawborn (1945) reported a recommended Minimum Daily Requirement (MDR) of 0.4mg per 100 grams body weight. Collins and Elvehjem, in 1958, established a MDR of 0.5mg per 100 grams of body weight, solely to prevent scurvy. Today, we are inclined to believe that the MDR is actually closer to twice that amount, or 1 mg per 100 grams bodyweight is necessary for optimum health and growth rates. Interestingly enough, the amount of Vit C required by cavies appears to vary with age and gender. Some females were reported to have survived up to 60 days on the balanced diet without Vit C as opposed to the normal survival time of 21 to 27 days, however the results ended the same - cavies on the Vitamin C-free diet all succumbed in the end. How does this work out for your pig? Let's say you have a pig that weighs 36 ounces, or roughly one kilogram. There are 1000 grams per kilogram, and the dose is 1 mg per 100 grams. That yields 10 mg per 1000 gram piggy. Your piggy needs a minimum of 10 mgs of Vit C daily for pure basic survival, and closer to 20-25 mgs of Vitamin C for optimum health. Technically, one ounce of pellets a day is enough to keep each adult cavy alive. However, most of us give about 4-5 ounces of food per cavy a day, which yields a dose of 52-65 mgs of Vit C each cavy per day which is about twice what they need. This is assuming that the feed was milled that day, which it won't have been. You can estimate that if the food is 2-3 months old, the dose of Vitamin C is about half what it should be, so if I feed 4 ounces a day of this feed per animal they are getting closer to 25-30 mgs of Vitamin C.
I think it's important to recognize that everything is to be taken in moderation. There have been many studies as of late regarding the effects of Vitamin overdosing in humans, one of the most significant discoveries is that excessive Vitamin C can interfere with female hormone depressants, namely the Birth Control Pill. We tend to overdose ourselves with Vitamin C when we are surrounded by sick co-workers, or feel a bit of a sniffle, we break out that bottle of 500mg Vitamin C capsules and eat them like mints. Are we doing more harm than good? In 1960, a researcher named Gordinoff kept an experimental herd of guinea pigs on a four week regimented diet of an estimated 500 mgs Vitamin C per day. He found that these cavies would develop scurvy much more rapidly, than did control animals, when Vitamin C was excluded from the diet. Cochrane (1965) observed that two sisters, out of a sow which had been receiving 1 gram of Vitamin C per day (1000 x MDR) during pregnancy, succumbed to scurvy when offered a diet with the minimum of 10 mgs/kg of Vitamin C. He speculated that these offspring had been conditioned in utero to a higher than normal rate of Vitamin C.
Sorrensen (1974) fed an experimental group of cavies a diet that contained 86 grams Vitamin C/kg of diet for 275 days. He found that the growth rate of the animals on the higher dose was significantly slower than the animals who received a diet of only 2 grams Vitamin C/kg. He then added radioactive Vitamin C to the diet of both groups, and measured the amounts that their bodies metabolised. He found that the pigs who had been kept on the higher doses used up the new Vitamin C much more quickly He concluded that dosing cavies with high levels of Vitamin C over long periods of time does little good, and will actually condition guinea pigs to develop scurvy more rapidly in times of reduced Vitamin C.
While adverse side effects of vitamin C are rare, vitamin C in high doses may actually cause kidney stones or anemia due to blood cell destruction in people. In this case, the high dose is 1 gram a day in people, which translates to about 100 mgs a day in cavies. How Do Your Favorite Greens Rate? Guinea pigs, being so close to the ground, have their noses in everything. Consequently, they tend to pick up a lot of pathogens, if kept in unsanitary conditions. The respiratory system of the cavy is pretty sensitive to changes in strong odors, temperatures, humidity and contagious pathogens. There are many pathogens which are in the system of the cavy constantly, yet it takes a stressor to bring this pathogen to fruition. This means the body gets stressed, and where a latent pathogen might have been lying around dormant for months, suddenly the immune system cannot keep it at bay any longer, and the animal breaks with that illness. I hear from a lot of people who buy a pig from a pet store, and the pig comes down with a sniffly nose or crusty eyes within the week. This was from poor quarantine procedures in the pet store, where one ill animal spread the pathogen to the rest. The pet store should work with you to obtain veterinary assistance for the guinea pig, as most pet stores offer a 10-14 day health guarantee. Remember, that health guarantee is null and void if you expose the new animal to another guinea pig which could carry any pathogens, because you can't hold the pet store at fault if you expose a new healthy guinea pig to a sick one you already have. Bordatella bronchiseptica is a commonly found pathogen, in fact, the same pathogen which is responsible for kennel cough in dogs. Respiratory infections can also come from Pasturella, Klebsiella, Streptococcus and Pseudomonas species. Cavies might initially exhibit a crusty eye or a snotty nose, typical cold like symptoms, most people think a guinea pig gets a cold like you or I do, and it will run its course. This is not true in the case of the guinea pig. Piggies' colds turn serious VERY quickly, and usually turn to pneumonia within 3-5 days, characterized with clicking in the lungs, rattly breathing, and a very letharic pig that generally just doesn't feel well. The appetite is diminished, and being that the sense of smell is affected, the pig isn't interested or tempted by many treats. Gestation of this illness is 3-5 days after initial contact with an infected animal. The best thing you can do is to keep that piggie eating at all costs. Going off of food or water tends to be one of the quickest killers of guinea pigs. Dehydration kills more pigs very quickly than any other pathogen or illness. By keeping your pig eating, even force feeding him or her if necessary, you are preventing molar overgrowth issues down the line. Some things you can do at home to make your piggy a bit more comfortable include the smallest little swipe of Vicks' Vaporub on top of the nose, a humidifier in the room (taking your pig into the bathroom while you shower also helps), placing a red light heat lamp over their cage to ensure that they don't get too cold, draping a towel over the cage to keep drafts out, and keeping the pig in a low energy level, low noise room. You can increase the Vitamin C levels to about 80 mgs a day, but remember when you lower this level, you'll have to wean them off of it gradually to prevent scurvy symptoms. If the pig is already showing signs of pneumonia, you will want to get them into the vet for antibiotics. Septra (sulfa based antibiotic commonly known as trimethoprim sulphonamide) or Baytril (enrofloxacin) for adult pigs are the best antibiotics to treat this. The dose of Septra is 0.48 mg/kg daily for 10 days, and Baytril is 5-10 mg/kg daily for 7-10 days. The treatment may be stretched to 14 days if the animal is slow to respond to the medication. The antibiotics may be injected or liquid, and many pigs take this liquid willingly. If the pig is drastically congested, a treatment of a diuretic (ie Lasix) might be necessary. Your vet will be able to diagnose this for you and prescribe treatment, yet you should know what the course of treatment should be to determine if your vet is competent about treating guinea pigs. Homeopathic remedies include coltsfoot, chickweed, garlic, yarrow, comfrey, plaintain and mallow. If you expose your pigs to other pigs or possible pathogen carriers frequently (ie shows, educational seminars, etc) you may want to consider giving them a Bordatella vaccination. A competent small animal vet should be able to assist you with this vaccine, ensuring that aluminum hydroxide is not present in the vaccine, as cavies may have a negative reaction to this compound. Usually, a drop of the vaccine in each nostril of the cavy should be sufficient. This dose needs to be repeated 15-20 days later. No matter how hard you try chances are your cavy will be exposed to either one of these horrid parasites in the course of its lifetime. Mites and lice are far more prevalent than we'd like to believe. Lice are large enough to be seen on the coat, usually at the base of the hairs on the skin. Therunning form (adults) are viewed as tiny little whitish worms, or the eggs (nits) can be viewed as tiny white, red or black specks usually sticking on the actual tips of the hairs. One of the ways I check for lice on any pigs is to lift up the ear-flap from the face and to push back the hairs directly in front of the ear opening. This is the spot that they seem to be most prevalent. You will often see a thinning of the coat, a dulled appearance to the overall coat, and possibly a very itchy guinea pig. Microscopic skin scrapings are not necessary to diagnose lice. They are readily visible on the coat. The lice make a small incision in the skin of the animal, yet draw fluids from the skin, not from the blood. For this reason, you cannot use an ingested or injected agent to kill them off. They must be drowned or killed with pyrethrins, topically. The old method of getting rid of lice involved a dousing massage of oil of sassafrass, which is not readily available these days. Instead, we use a topical application (either bathing or spray) of a pyrethrin product. I personally like Ectosoothe shampoo or Zodiak kitten flea and tick shampoo. Both are safe to use on kittens, which also have a very sensitive respiratory tract. I have used both shampoos effectively and safely. The trick is to leave the shampoo on for the full 10-minute contact time in order for the pyrethrins to work. 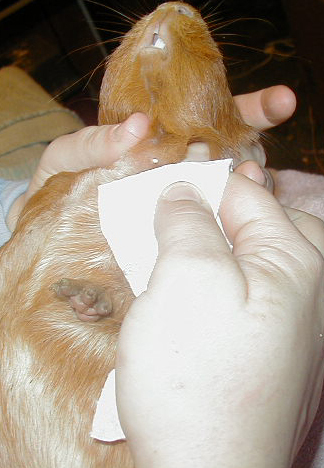 You must rinse and dry the guinea pig fully, and be sure to repeat the treatment in a week to kill hatching nits. According to Richardson (2000) you can also use a suspension called Seleen (1% selenium sulfide) as a shampoo. Contact time on the Seleen is for 5 minutes, and again, repeat weekly if necessary. This treatment is also good for seborrhea. The latest treatment of lice for the larger scale hobbiest or breeder is to use Advantage or Frontline Plus on the cavies. You would get the exact same treatment for your dog (for larger herds, buy the largest package you can find, for the most treatments) and place a single drop on an adult animal behind the ear flap. For a youngster, I simply wet a q-tip with the Advantage or Frontline, and sparingly wipe down the area behind the ear. This will also need to be repeated in 7-10 days, and in the case of severe infections, again for a third treatment 10 days past the second treatment. One thing to remember is that these products are licensed by the FDA to only treat sheep, cattle, dogs and horses. They have not been licensed to treat cavies. While many vets use them and have done so with great success, your vet legally cannot recommend them for cavies, as it would be considered 'off label' use. Legally your vet cannot resell these items for a purpose that it was not intended for, so don't be surprised if your vet refuses to sell it to you. If need be, find a friend who uses it on their dogs and ask to swipe a drop or two for your cavies. You may also order it online from many sources (Supplies section, Appendix). Mites, on the other hand, are small burrowing microscopic blood sucking creatures. They can be viewed by taking a small scraping of skin and peering at it under a dissection microscope. Mites, while being too small to see with the naked eye, are one of the largest problems in guinea pigs. You will also note they can be referred to as selnick, or mange mites. The usual symptoms of mites include hair loss, particularly over the shoulders, neck and back, constant itching, squeaking while being handled, biting while touched, red irritated skin, lackluster and thinning coat, self-injuries from scratching, and can often (if infested enough) lead to convulsive fits. If a sow is pregnant, she might abort or reabsorb her litter, if a boar is in breeding, he might be so uncomfortable he cannot mate. It's safe to treat a youngster at 3-4 weeks of age, but you want to avoid treating a heavily pregnant sow, one in her first month of pregnancy, or a sow who is nursing young. It is imperative that this treatement be repeated in 7-10 days from the initial treatment, in order to kill off nits that hatched in the interim. Oftentimes a third treatment 10 days after the second one can be helpful to ensure you are rid of the pests. Ringworm is one of the very few things your piggy can catch from you and vice versa. It is especially important to ensure young children wash up each and every time before they handle the piggy to avoid transmitting things to the pig. Ringworm is usually found on the face and head, but can be found anywhere on the body. It is characterized by a found circle of raised dots on the skin, or a patch of hair missing (hair can very easily be pulled out with minimal effort) and usually some flaking of the skin. If dandruff is very severe, shampoo the pig with an antifungal shampoo (Desonex or any good seborrhea dandruff shampoo) but shampoo with 0.5% hexetidine is preferred. Leave the shampoo on for up to an hour, rinse well, and dry. Then apply a thin coat of athelete's foot powder or cream, rubbed in well. Tinactin is the product of choice for creams, and may be applied twice daily to any affected areas. This topical treatment must be used daily for about 10 days to break the cycle. 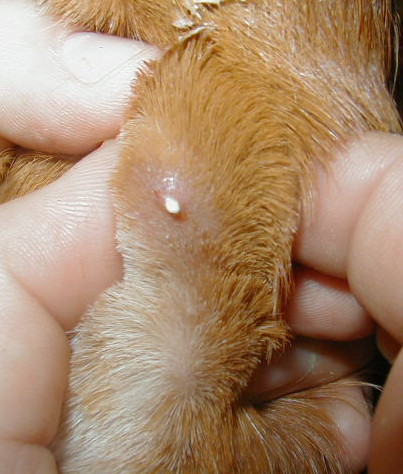 For pigs with very determined ringworm, Griseofulvin may be used as an oral treatment. The dose is 25 mg/kg and must be given for a month. Do not use Griseofulvin with animals under 3 months of age or in pregnant sows - it can cause infant mortality. Often a pregnant sow is overcome with different hormones in her body, same as with human women. This can lead to sporadic hair loss in the center of the back, which can scab over. The best treatment is to cleanse with saline solution and rub a bit of triple antibiotic cream into the sore. If you see this type of sore on your pig, and the pig is not pregnant, investigate your food. Richardson (2000) maintains that barley or corn, being a very 'hot' food (lots of energy with little fiber or protein) can also cause this type of sore. One of most frightening things to a new cavy owner is to be petting or grooming your cavy and suddenly noticing that there are bald spots behind each ear flap! For some odd reason, cavies have bald spots behind their ears, about the size of the ear flap. This section of skin has no sweat glands and little to no hair follicles. The author's theory behind this is that the bald spots help cool the cavy down if he or she overheats, the blood vessels in each ear engorge allowing heat dissipation through the ear flaps, and can also include these two bald spots to enlarge the area of dissipation. It also provides a wonderful platform on which to administer Advantage or Frontline for treating lice or ticks. An abcess is a pocket formed under the skin, usually after a trauma injury (bump) or a bite or other wound. The skin is opened and the flesh underneath is exposed to the air and to bacteria. The wound generally closes, and when it hasn't been properly disinfected, germs continue to multiply under the closed scab. The body's immune system sends out white blood cells to kill off the invading bacteria and both cells clot under this scab, creating pus. It continues to build until the pressure forces it out, at its weakest point. When it bursts, it can either burst outwards draining from the body or it can burst inwards, draining into the body. Almost all the abcesses found on guinea pigs are around the face and neck (can be caused by sharp bits of hay or scratches or bites), on the rump or shoulder (bites from other pigs or scratching from parasites) or occasionally on the feet (from either hay or caging scratches). As long as it drains well and is kept clean, it's rarely a serious problem. Most of the time you'll find your piggy goes off of food if the abcess is around it's face or neck. The reason for this is that it becomes very difficult for the piggy to eat, drink or swallow with this pressure around its' mouth and throat. If the abcess is on the body, you'll usually detect it in your daily routine. Hopefully, you've noticed the wound prior to the abcess growth, but sometimes the abcesses form fairly quickly. Place your piggy on a table or counter on a towel. Sometimes towels are necessary for restraining the pig, but I usually find them cumbersome. I keep the towel handy just in case I get a wiggly pig and he needs to be held in one place. Gently probe the suspected area with your fingers, and compare each side, the left to the right. You should notice a definite swelling and hardening of the area in question. You can often times detect the point of entry (wound location) and tell where the injury occurred. If you have any squeamishness about treating your piggy at home, it's best to enlist the care of your local exotics vet or to find a local breeder. Place the cavy so that you can work comfortably with little restraint. It's helpful oftentimes to have a helper hold the pig. Take your scissors and trim the excess hair from the location, so that the hair doesn't grow into the wound creating more infection. Soak the scab with the wet washcloth, scrubbing lightly. You may have to use the edge of a fingernail to scrape the scab away. The piggy won't be happy, but remember, she'll be happier once she can eat again! If you cannot find a point of injury scab, you may have to use a sterile needle or a scalpel blade to open the abcess. Either way, the abcess needs to be drained and treated. Once you break the abcess open, you'll see the pus draining out. It's often yellow or green, indicating a higher rate of infection than white pus. With luck, the area will also be bleeding lightly. The blood helps to flush the wound, keeping it cleansed. Aim the piggy away from you and with your fingers or thumb, begin to work the pus out by pressing against the abcess. You don't want to press the pus inwards, but rather use the built up pressure inside the wound to help expel the pus. Yes, this is pretty gross, and it makes a mess, but it also makes for a much happier healthier piggy! Once you've gotten as much pus out as you can, wipe the area with the paper towels or the gauze to clean as much bacteria and pus off of it as you can. Continue pressing and draining until you get bright red blood, meaning the abcess is able to flush itself with the blood. You then need to rinse out the wound with the sterile saline solution, being careful not to touch the tip of the bottle against the skin. Rinse it until it runs clear. By holding the abcess immobile, I can guarantee I'm not going to lance the abcess inward into the body cavity. I withdraw the needle, and begin applying pressure to the pocket of fluid. You can see a small bit of the pus draining out, I have ready a piece of surgical gauze pad to collect the pus and wipe the wound clear. Ellie hasn't actually uttered a sound through this whole event! It's important to grip the abcess from underneath, so that you can be sure you are draining out, not accidentally causing it to burst inward. Maintain pressure on the abcess until it begins to drain bright fresh blood, this will help keep the pus drained out. Kirstin Key 2002. When you've cleansed it as much as you can, take the antibacterial or antimicrobial ointment or cream such as panalog, neosporin or a good triple antibiotic cream and pack as much into the wound as you can. Often you can gently lift the skin away from the body, which will allow you to open that pocket, getting the cream or ointment into the entire pocket. This will help it from getting reinfected. Avoid using the creams or ointments with pain reliever as this would be detrimental if eaten by the cavy. You may have to re-lance it in a day if you didn't get enough pus out or enough cream or ointment in. These heal very quickly once cleansed, and should be unnoticable in about 3 days. You can see the clipped hairs and the point of entry of the needle above, and the area is flat again, with no pocket underneath. This photo was taken five minutes after the abcess was opened, and before I put antibiotic ointment over the wound. If the wound were a bit larger, you would want to pack the entire pocket with antibiotic cream or ointment. You can see a tiny drop of blood at the point of entry, which is good, as long as it is bleeding very little. Blood keeps the wound flushed out and prevents reinfection. **I do NOT suggest using hydrogen peroxide on a wound such as this. The reason I shy away from it is because as soon as it touches the open flesh, it immediately forms a scab. If there is bacteria under this scab, the area immediately creates another abcess. While it is a wonderful antibacterial agent, I prefer the creams and ointments which work more slowly yet more efficiently in this capacity, that do not leave as large of a scar on the pig. Cysts are similar to abcesses, only they are found mostly on the hind end, but can also be found anywhere on the body. You will come across a small squishy lump on the body, with no heat and no obvious wound, about the size of a lentil. This is a sebacious cyst, and essentially is an infected hair follicle, like an ingrown hair. Leave it alone for a few days, and monitor it. If it disappears, this means the body has absorbed the fluid inside. If it continues to persist you can treat it at home. This can be squeezed gently (like a blackhead) and a touch of antibiotic cream or neosporin can be rubbed onto the area to prevent infection. Another well known skin condition will be a problem with the grease gland, which is going to be obviously more prominent in boars than sows. The grease gland is a small gland based at the bottom of the spine, directly above where a tail would be attached to the body. This is very similar to the preen gland in birds, and secretes a thick greasy oil to help in grooming. It can be spread over the body to help insulate the animal and keep the hair in good condition, much like a hot oil treatment for us. Often times with a thickly obese animal, they cannot literally reach around far enough to spread this oil on their coats and it begins to accumulate. Other problems can arise if the animal's gland is overactive and produces too much grease for the animal to keep up with. In either case, the excess must be removed for the comfort and cleanliness of the cavy.